Village Builders was founded to provide custom construction services for residential and light commercial projects. From small home improvements to design/build additions and new construction we are set up to create the structure that reflects your vision. 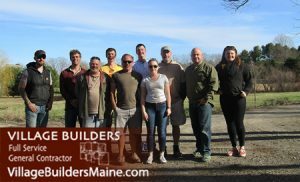 Founded in 2002 and incorporated in 2008, Village Builders employs carpenters and contracts with the rest of the building trades to implement your project. We are fully insured and financially stable. Our offices at 21 New Portland Road in Gorham are the base of our business and headquarters for sales, design and project management. We look at each major project through the eyes of an engineer. Our owner, Dan Grant has a Chemical Engineering degree, which required 3 years of study in heat transfer and thermodynamics, backed by 5 additional years of experience with heat transfer modeling and heating system design. Dan has developed a heat loss/solar gain model for home and office design work, which has proven invaluable for situating projects properly on the site, sizing and locating windows, and establishing heating and ventilating system requirements. These are just some of the differences that make Village Builders the best choice for new building or renovation projects. Give us a call or drop us an e-mail. We’ll set up an appointment to stop by and start exploring the possibilities for your home, budget and lifestyle.